The Maverick V2 indicator is an intermarket leading indicator specifically developed for EURUSD only, and it is based on EURCHF, EURAUD, AUDUSD and the USDCHF pairs. The same market data are used, as in our EURUSD risk warning /take profit indicator. It tracks how money moves between Risk and Safe haven markets. It took an entire year to make this indicator and its algorithms. Intermarket analysis of this type allows the indicator to give solid early signals, before EURUSD's own price does! Because it tracks the risk appetite/risk aversion trend, not the price or momentum of EURUSD itself. And this is done through a proprietary algorithm, not through classic methods. When risk appetite dominates, EURUSD will rally, and when risk aversion dominates EURUSD will fall, period! The indicator produces a thick yellow line and a thiner orange line which are set to either +5 or -5. When the yellow thick line is 5, it means that the current candle/bar on the chart is expected to be bullish, and when it is at -5 it's expected to be bearish. 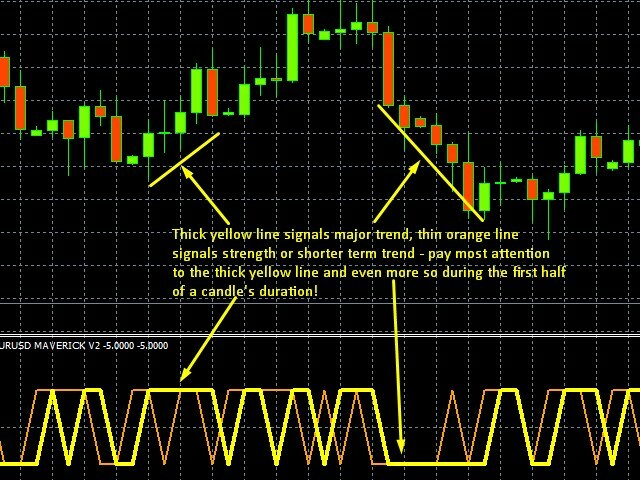 The orangeline works the same way and it shows the strength of the trend in more detail or the shorter term trend, such as a down 1 hour candle, which is part of an overall bullish 4 hour candle, in this case the thick yellow line will remain up while the thin orange line will go down for some time. 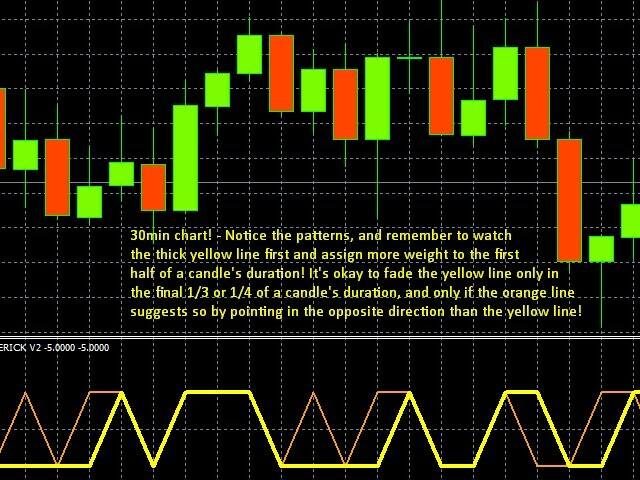 It's best to calculate candle time (remainign time is shown by the indicator), and to breakdown the time into 2, 3 or 4 parts. This indicator is very reliable during the 1/2 of a candle's duration, and least reliable in the final 1/3 or 1/4, this is where the different traders will use different methods, such as different trade size depending on the timing. Signals on the 4 hour chart give you plenty of time to get reliable readings, as 1/2 of a candle is 2 entire hours. All the trader has to do is watch the lines and see when the orange line may give a warning. Or use together with other indicators to time the exit/profit level etc. The yellow thick line is quite stable and rarely repaints, especially on the 4 hour chart it is very reliable. False signals do occur but they are rare and they tend to occur more towards the final time of a candle's duration. That's why the candle remaining time is also shown by the indicator. If both lines are set to +5, the market is very bullish, if however later the yellow line remains at +5, and the orange line drops to -5, it signals cautions, lack of strength, possible time to get out of the trade, or even a reversal. If the two lines start to disagree early after a new candle has started, for example on the 4 hour chart, and the yellowline points up to +5, and the orangeline points to -5, this is a sign that the market will drop for 30minutes to one hour, but the whole 4 hour candle remains bullish! This indicator is being further developed so as to develop 3 state indicator (buy-sell-neutral), and few more versions of this function, through more data processing, so that the function can be used to make more specific indicators or an EA. 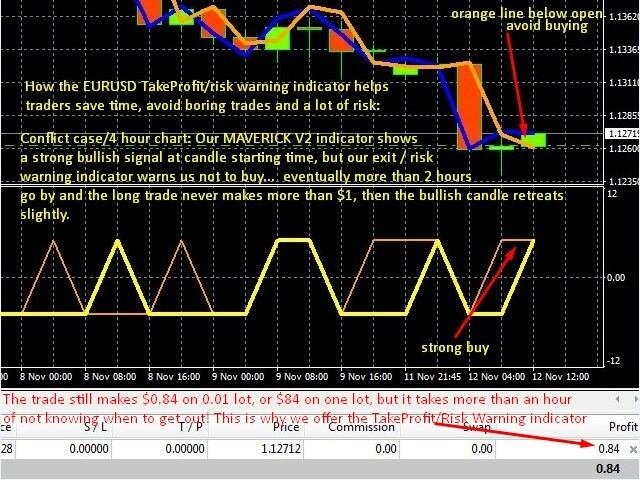 This indicator however doesn't have the kind of risk warning, wrong trade avoidance capability that our $800 indicator has, if the two are used together the trader has a much better risk assessment view, if the indicator (Maverick V2) is used on its own, it will still work but the trader will miss good exit/entry points, as only the major trend is revealed. Nonetheless, even in this basic form, the indicator still works well. sama as original version, compatible with most brokers. This version is the same as version 2 but it is for ECN accounts only where market symbols have the suffix 'i' in the end.